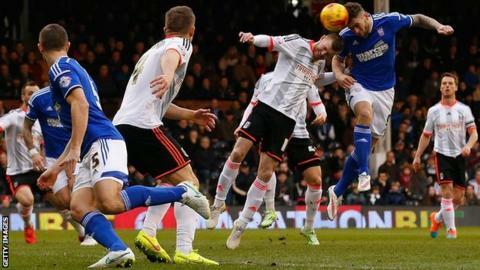 Striker Daryl Murphy scored twice to take his tally for the season to 21 as Ipswich moved to within two points of the automatic promotion spots. The in-form striker, 31, headed Ipswich in front from a fifth-minute Jay Tabb corner and then curled in another to make it 2-0 just before half-time. Ross McCormack tapped in his 12th goal of the season 16 minutes from time as Fulham threatened a comeback. But Christophe Berra almost added a third for Ipswich. With Championship leaders Bournemouth only drawing and Middlesbrough and Derby both in FA Cup action, Ipswich capitalised with a first away win in three attempts. Murphy made it three goals in four games as his header sneaked past Fulham keeper Marcus Bettinelli and just inside the far post. But Bettinelli had no chance when Murphy doubled the visitors' lead in the final minute of the first half, collecting a pass from Tyrone Mings before calmly locating the bottom corner. Fulham improved after the break with Hugo Rodallega heading just over the bar before they were gifted a goal. Ipswich defender Tommy Smith failed to deal with a cross from Konstantinos Stafylidis and McCormack was left with a simple finish from eight yards out to claim his 12th goal of the season. However, Fulham were unable to build on that and Berra was denied another goal for Ipswich by a goal-line clearance from Stafylidis as the Cottagers' winless run stretched to six games. Noel Hunt went off injured after Ipswich Town had used all subs. Shaun Hutchinson went off injured after Fulham had used all subs. Delay in match Shaun Hutchinson (Fulham) because of an injury. Delay in match Noel Hunt (Ipswich Town) because of an injury. Attempt blocked. Ross McCormack (Fulham) with an attempt from outside the box is blocked. Assisted by Ryan Tunnicliffe. Hand ball by Luke Chambers (Ipswich Town). Substitution, Fulham. Patrick Roberts replaces Alexander Kacaniklic. Corner, Ipswich Town. Conceded by Nikolay Bodurov. Attempt blocked. Christophe Berra (Ipswich Town) right footed shot from the centre of the box is blocked. Attempt blocked. Tyrone Mings (Ipswich Town) left footed shot from the centre of the box is blocked. Attempt missed. Scott Parker (Fulham) right footed shot from outside the box is high and wide to the right following a set piece situation. Kevin Bru (Ipswich Town) is shown the yellow card for a bad foul. Attempt missed. Alexander Kacaniklic (Fulham) left footed shot from outside the box is too high. Assisted by Ryan Tunnicliffe. Attempt blocked. Cauley Woodrow (Fulham) right footed shot from outside the box is blocked. Assisted by Alexander Kacaniklic. Goal! Fulham 1, Ipswich Town 2. Ross McCormack (Fulham) right footed shot from the centre of the box to the high centre of the goal. Attempt saved. Teddy Bishop (Ipswich Town) left footed shot from outside the box is saved in the top centre of the goal. Assisted by Jonathan Parr. Corner, Fulham. Conceded by Kevin Bru. Attempt blocked. Alexander Kacaniklic (Fulham) left footed shot from the right side of the six yard box is blocked. Assisted by Shaun Hutchinson. Scott Parker (Fulham) wins a free kick in the attacking half.